If you're looking for a replacement PVA sponge mop head, you've come to the right place. Don't confuse The Super PVA mop refill with others you see in stores or online. This is the original! We offer 100% pure PVA sponge mop replacement heads which can be used on any standard PVA mop including: The Super, Magical, Rubbermaid, Sweep 'N Mop, Quickee, and Wilen 11" PVA mops. The PVA ribbed sponge replacement head is mounted to a black anodized gripper. Simply attach with four screws from your existing mop, purchase standard #10 - 1/2" sheet metal screws at a local hardware store, or order a set of 4 screws as shown below. 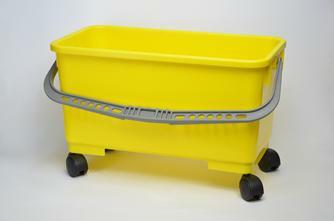 NOTE: The 11" mop will not fit a standard round bucket (rectangular buckets are OK). The 16" mop is oversized and requires a larger bucket. See The Super Bucket product listing (below). Or, wring out your mop in a wash tub or a sink. Check that your PVA Mop has four holes with four screws holding the PVA mop head to two brackets. The mop holes are measured from the "centers" of the holes: 4 3/4" between outside holes, 3 5/8" between inside holes, 1/2" between each set of holes. The 11" gripper is actually about 10 1/2" - 10 3/4" long. The 16" gripper is actually 15" - 15 1/2" long. The 7" gripper is a full 7" length. 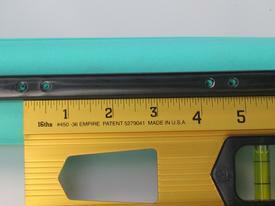 Holes will measure the same on all 3 sizes of PVA mop head refills. A slight variance will definitely work as long as the two sets of holes are 1/2" apart. Thanks for the follow-up. I'm very happy with my order and your service is exceptional.